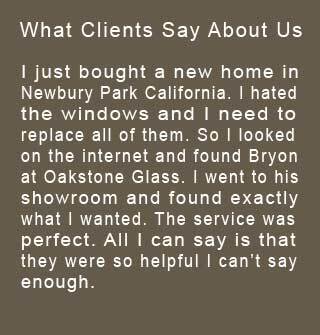 Thanks, Oakstone Glass! I am very pleased with my glass tops and will be ordering more for many pieces of furniture for my home. The prices are very reasonable and the customer service is top notch. Great company. Excellent work from quote through installation. The new frameless shower door looks great and I am extremely pleased. The company who tiled the shower for me two years ago could have done a somewhat better job and since the bathroom is extremely small, every slight miss has the potential to carry a greater impact than it may in a larger bathroom. I was very confident that Eddie paid extremely close attention to the nuances in both their work and the bathroom configuration and accounted for all of it accordingly. It factored heavily into my decision to choose Oakstone Glass. My only regret is that I waited two years to get my act together and place the order! 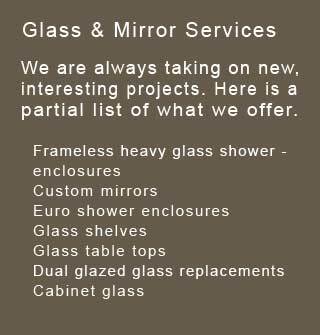 They were a pleasure to work with and I will not hesitate to call again for any future needs as well as recommend Oakstone Glass to anyone I hear of needing glass or mirror work done. Travis had me scheduled for the day after I called. Eddie came out and was totally professional. 1 week later I had my totally custom wall of mirrors installed. The whole process was easy and fast. I highly recommend Oakstone Glass for any of your glass needs. 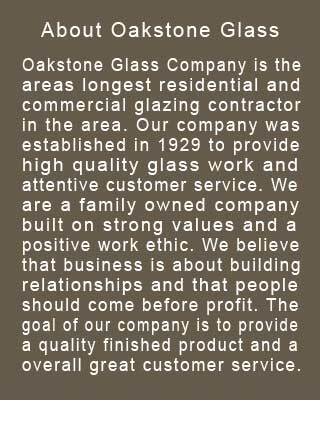 We were referred to Oakstone Glass Company, by a good family friend. He said that it’s the place to go. We were looking into giving our second bathroom a little face lift. They offer free, in home estimates for the work you're interested in. We've gone back and forth with a few other companies and other quotes. Considering the reasonable pricing and good old fashioned customer service, it's safe to say who will be giving our bathroom the updating it so badly needs. Thanks guys! A+ customer service, friendly and knowledgeable installers. Manny and Art are the best. They arrived on time, worked very diligently, and were very friendly. They were a joy to welcome into our home. I just love the 2 mirrors and frameless shower doors they installed very expertly. What a wonderful, beautiful difference all that makes in my 30+ year old newly renovated master bath. Thank you, Oakstone Glass and Manny / Art. This is my second experience with Oakstone Glass. Both times they sold me the right product and installed it on time and on budget. There are never any surprises except how painless the experience is.